In the summer, perfectly ripe tomatoes are a real treat; beef tomatoes, plum and the array of colourful speciality tomatoes are perfect for so many summery dishes. 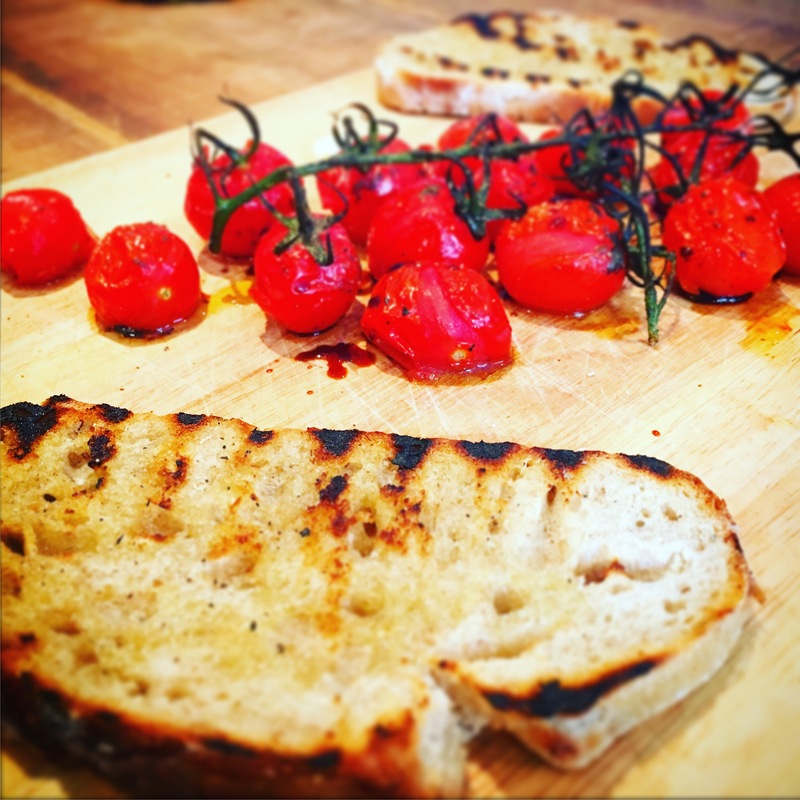 This really easy simple treatment for a few vine tomatoes makes a great quick lunch or a nice appetiser. This recipe has a slight influence from what’s known in Mallorca as P’am Boli. 1 Pack of vine tomatoes (I used baby vine plum tomatoes for their plumpness). 2 Tablespoons of Extra Virgin Olive oil. Slices of sourdough (mines a nice homemade rye and white flour sourdough but you can use whatever bread you fancy). 1. Pre-heat the oven to 180 degrees C.
2. Wash the tomatoes then dab dry with some paper towel and place in a bowl. You can either pull the tomatoes off the vine or leave them on the vine for a decorative effect. 3. Pour the olive oil and vinegar over the tomatoes. Sprinkle over the paprika, salt and pepper. Making sure the tomatoes get a good coating. 4. Get a small roasting tin and place the tomatoes into it. Drizzle over any remaining Vinegar/oil mixture. 5. Place into the oven and roast for around 10-15 minutes depending on how fierce your oven is. You’ll know when they’re done because the skins will go all wrinkly. 6. Meanwhile, heat a griddle pan (or a frying pan if you don’t have a griddle pan) on a hob. 7. Drizzle a little oil onto your bread slices (both sides) then place them into your heated pan. Once one side of your bread slices have nice griddle stripes turn them over and do the same to the other side. 8. Remove the tomatoes from the oven. 9. Arrange the tomatoes on a board along with the bread. Peel and tail a clove of garlic and place onto the board. 10. Rub the garlic clove briskly over a slice of the griddled bread. 11. Take a couple of tomatoes either leave them whole and place them on the bread or squash them onto the bread so the juices are absorbed and enjoy!